VoIPstudio is an award-winning VoIP system that offers businesses of all sizes a scalable communication solution. It’s inexpensive, easy-to-use, offers a full suite of PBX features, and is fully integrated for CRM. Best of all, you can try it for free with our 30-day, no-risk trial. Start a free 30 day trial today! VoIPstudio offers businesses of all sizes crystal-clear communication via the internet to other softlines for free, to landlines at reduced rates, as well as chat and video conferencing for free. Whether you need to reach out to your employees on-the-go or conference a call with attendees from around the world, VoIPstudio is your all-in-one solution. Enjoy free and unlimited internet calls via our smartphone app, computers, or VoIP phones. Beyond the best VoIP calls, VoIP phones can also call landlines and mobile phones at discounted rates, too. See pricing for more details. We know that happy customers don’t need a contract to stick with their VoIP service provider, that’s why VoIPstudio won’t make you sign one. Enlist the advanced features of a VoIP phone system that easily integrates with your existing Salesforce CRM account. Get the plugin and get going. Make VoIP phone calls right after you sign up. Enjoy enterprise-class features such as call recording, voicemail, conference calling, IVR, a reception console, ACD queues, virtual numbers, and more—all for one low monthly rate. Flexibility, fair pricing, good support, easy worldwide management. The best VoIP phone service I've ever tried. The management UI and user software was pretty intuitive to us and hands-down better than anything else we saw. That's the business VoIP solution we've been looking for. Yes, we are happy with this VoIP service. The main reason is reliability. Our intuitive design allows you to sign up and start using your new VoIP service right away. Do all this, and so much more. Try it for yourself today! Easily transition your VoIP service between any device with free IP calling using our smartphone app, your tablet, laptop, desktop or your VoIP phone. Your service also easily tracks and connects to fixed and mobile lines at reduced calling rates. No matter where you’re calling from, all of your calling data will show up in your personal web portal where you have full control of your entire VoIP system. Get started today! 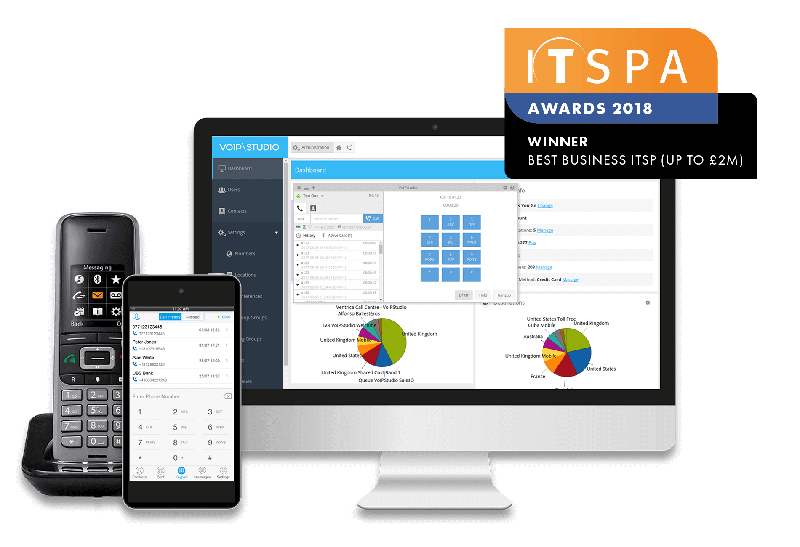 In a competition for the top VoIP service providers, the Internet Telephony Service Providers’ Association (ITSPA) awarded VoIPstudio the title Best ITSP Business in their £2m tier. We’re also a 5 Star Business on TrustPilot, one of the most trusted customer review platforms on the web. We believe we earned those awards by offering customers a professional-grade solution for business communications in-house and across the world at one low monthly rate. From a full-featured PBX to low-cost VoIP phones, we’ve got you covered. Even better, everyone gets to try it for free, for 30 days. Thousands of businesses across the world trust VoIPstudio for all of their most vital business communications. * Non-geografical numbers supplied free of charge in some countries. Geographical numbers priced from US$ 6.23 per month, plus US$ 6.23 set up fee. Once you sign up for our 30-day free trial, you’ll get full access to your very own VoIPstudio web portal where you can use our fully functional virtual PBX features without any obligations. While most people decide to sign-up after they’ve tried it free for 30 days, if you decide it’s not for you, you don’t have to do anything. Your trial will end automatically, and no monthly fees will be charged. To get started, simply provide us with your telephone number. You do not need to give us a credit card to begin your free trial. Simply sign up for an account and your VoIP phone web portal will be ready to use right away. Visit our FAQ section to get all of your questions about VoIPstudio answered, today.